TRINIDAD, Oct 09, 2018 (SEND2PRESS NEWSWIRE) -- With society continuing to place great emphasis on youthfulness, for many women, aging presents its own unique midlife crisis. Desiree Arnold understands firsthand the emotional and physical toil on women upon reaching their 40's and beyond. A holistic practitioner, naturopath and the founder of Lifely Up, a web portal dedicated to menopausal transition, Arnold wanted to nurture women through a passage that she feels should be celebrated not vilified. She took it upon herself to consult female experts from around the world for their insight and advice and the "Women's Midlife Revolution Summit" is the result of her efforts. A free online conference set to launch October 23 through November 2, 2018 the "Women's Midlife Revolution Summit 2018" is available at https://womensmidliferevolutionsummit.com/. Shifting the perception of aging, midlife and menopausal transition from a negative outlook to an exciting journey is a rapidly emerging concept in this new day of women reclaiming their power. Older women in particular are garnering media attention for feats no longer just designated to a younger generation. The "Women's Midlife Revolution Summit 2018" presents a wonderful opportunity for women to learn, bond and share in the privacy of their homes as Arnold interviews 22 professionals, releasing two new interviews per day over a 11-day period. Female nutritionists, doctors, herbalists, holistic therapists, authors, life coaches, entrepreneurs, hormone experts, and physical trainers have all been gathered to lend credence to the joy of seasoned womanhood. "Living decades beyond midlife is still a newfangled phenomenon that many of us are now embracing. But for many of us, the thought of living beyond 50 for another 30, 40, or more years is shaded by fears of chronic disease, high medical bills and even living alone. Menopausal transition prepares the body, mind, and soul for that third stage in our lives where we actually can become masters of life as empresses and goddesses. The 'Women's Midlife Revolution Summit 2018' presents the opportunity to take action now and learn to understand and treat ourselves in ways that favor long healthy meaningful years and decades, to which we can gracefully look forward to," explains Arnold, who was born and grew up in Switzerland and has lived for the past 23 years on the island state of Trinidad and Tobago. Some of the topics to be covered over the 11-day period include understanding of the physical, emotional, energetical and spiritual changes during midlife; how hormonal changes affect us; nutrition for the midlife cycle; preventing chronic disease; resurrection of the female archetype and inspiration and motivation to get moving with joy. Some of the professionals who weigh in with their wisdom include Dr. Judith Boice, ND, LAc, FABNO, naturopathic doctor, licensed acupuncturist, and Fellow of the American Board of Naturopathic Oncology; Jennifer Gibbons-Joseph, CPC, ELI-MP Managing Director of Conec Professional Life Coaching Services Ltd; Susun Weed, author of the Wise Woman Herbal series and the voice of the Wise Woman Tradition; Meiling, the tour de force behind her premier Caribbean fashion house; Yvonne Heath, author of "Love Your Life to Death"; and Makeda Smith, veteran entertainment industry publicist and creator of the FlyingOver50 dance movement brand. 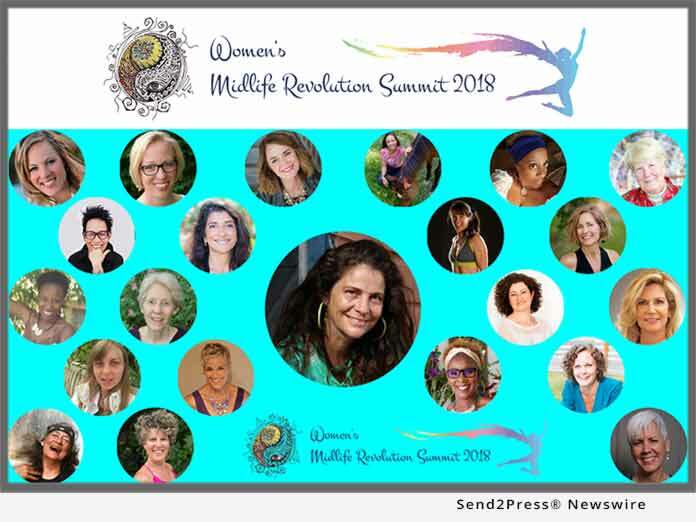 For registration and information about "Women's Midlife Revolution Summit 2018" go to https://womensmidliferevolutionsummit.com now!